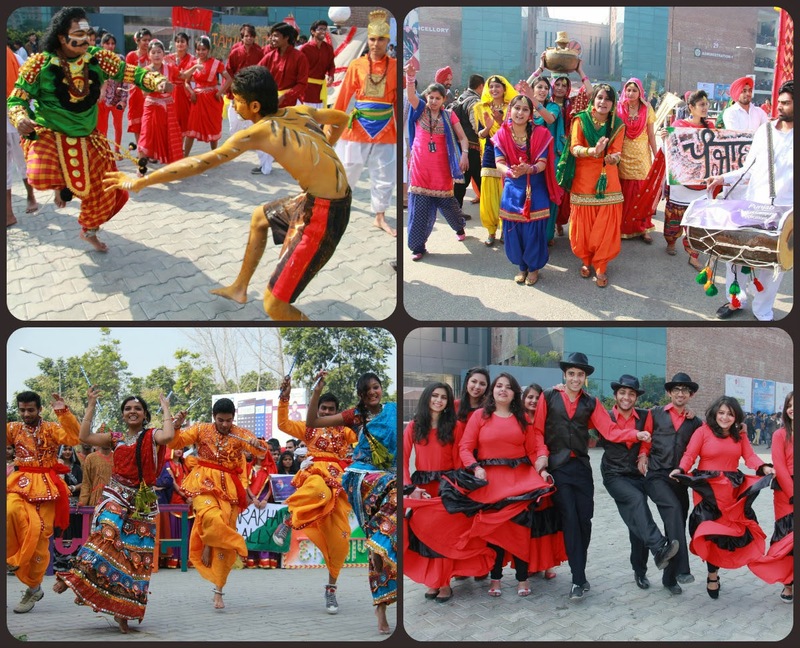 Jalandhar: Mega annual national cultural fest “One India” at Lovely Professional University converted its campus into Mini India, as many thousand students from 28 states gathered together to celebrate strength of India-unity in diversity. This, 5th mammoth festive of two-day celebrations is devised on the year’s theme ‘Dharohar-The Folk Arts’ to celebrate vast diversity at the campus. The event included deep glimpses in to rich heritage of Indian folk arts through its four distinguished parts-Procession, Exhibition, Music Concert, and Dance Show. Slogan of the year was “Hamare Gorav, Garima Kee Pehchan…Hamari Dharohar Hamari Shaan”. Palanquins, elephants, horses, drum beats, colourful dresses-banners, peculiar props added glitter and luster to the celebration. Shrieks, slogans, singing, shouts of sanctity from students produced overwhelming patriotic fervor all around. The fest was inaugurated by LPU Chancellor Mr Ashok Mittal. On the inaugural day, the beginning of One India was through one Km long procession which exhibited cultural colours of 28 states of India, where students used distinguished cultural props of their respective states. In the afternoon, 28 stalls displayed the peculiarities of respective Indian states to present the whole of India at LPU campus. During music concert in the evening, the folk tunes from all over the country created magical euphony. Similarly, the dance show presented different “Indian Folk Beats” which made students to dance along with the performers. The famous dances Kalbelia, Bihu,Lavani, Chau,Naati, Ghoomer, Domni, Sammi and many more on one platform reminded onlookers about Republic Day celebrations in New Delhi. Added to these was “Handicraft Exhibition” by the folk artisans from all over the country. Illustrative, this annual endeavour of the university is an effort to bind the students from different regions of India in a single knot of unity amid cultural diversity. For last four years this event is providing great power of togetherness to all the students and members of staff. Chancellor Mr Mittal elaborated more on the celebration: “In fact, our university annually holds two cultural fests of national and international importance-‘One India’ & ‘One World’. These two fests are to prove that "Diversity" is not just about the innumerable ways people differ, it is primarily about acknowledging the differences and to accommodate these differences willingly for valuable learning”. in Singapore, we observe National Day at the stadium or schools by wearing red and white....that's the shade of our Singapore hail the Singapore Girl's uniform is Sarong Kebaya.